Alexander Gray Associates presents paintings and drawings by Jack Tworkov (b.1900 – d.1982), selected from the artist’s “Knight Series” (1974–77). Embodying a key moment in the artist’s career, the series underscores the artist’s interest in geometry, mark making, and strategy by introducing patterns within a gridded composition based on the various possibilities of the knight’s moves across a chessboard. The development of a conceptual approach to painting in his late work was a radical evolution in Tworkov’s practice. Already a pivotal figure in Abstract Expressionism, he was also one of the first to question the movement’s commodification, cult of personality, and absorption into academia. By 1965 he took an interest in elementary geometry and abandoned his spontaneous flamelike brush strokes, shifting to a less subjective and more controlled diagrammatic form of abstraction that he found to be “more creative than working in a completely nihilistic way,” where “the limits impose a kind of order, yet the range of unexpected possibilities is infinite.” In 1974 Tworkov began the “Knight Series,” exploring these issues of limits, systems, and intuition. 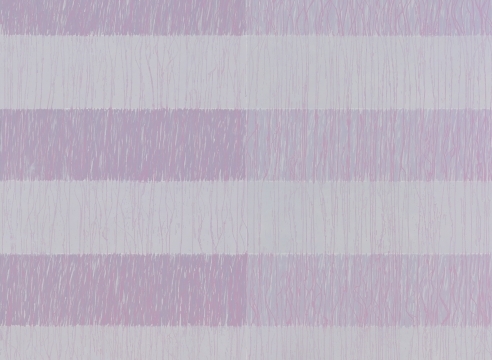 In paintings such as Knight Series #5 (Q3-76-#6), 1976, and Knight Series #3, 1975, compositions adopt a familiar grid system with construction lines and structural points that provide a delicate but firm framework embellished with formulaic vertical strokes in rows filling out each square. Unlike the more structured drawings, the paintings’ loose, but regulated brushwork reveals his experimentation with planar illusion and geometric form, representing Tworkov’s belief that “planning does not exclude intuitive and sometimes random play.” For Tworkov, it was vital that the intersecting vertical, horizontal, and slanted lines that resulted from this technique still allowed the viewer to see the simplicity of the painting’s fundamental structure. Related to strategy and war, Tworkov’s selection of the Knight icon is far from arbitrary. Taking an ardent position against the Vietnam War, Tworkov’s first painting in the series closely followed the fall of Saigon. Within the works, the metaphors of strategy and sequence serve as a response to the political climate, with compositions and processes where the artist favored logic and order over chaos and ambiguity. As art historian Lois Fichner-Rathus writes, “the derived patterns differ widely from work to work, just as the patterns of chess games differ. Still, they remain delimited by the confines of the game board as the rules that govern the movement of the pieces.” Works on paper, particularly 39 Continuous Knight Moves (NY 12-28-74 #6), 1974, and Knight Series - Pencil on paper #10 (Q4-75 #1), 1975, illustrate this process in formation, providing insight into the mechanism behind the large-scale canvases. Jack Tworkov’s work has been the subject of numerous one-person exhibitions, including the The Butler Institute of American Art, Youngstown, OH (2015); the Asheville Museum, NC (2015); Black Mountain College Museum and Art Center, Asheville, NC (2011); UBS Art Gallery, New York (2009); Boston College Museum, Chesnut Hill, MA (1994); Pennsylvania Academy of the Fine Arts, Philadelphia, PA (1987); Solomon R. Guggenheim Museum, New York (1982); Whitney Museum of American Art, New York (1971, 1964); and Poses Institute of Fine Arts, Brandeis University, Waltham, MA (1965). His work has been featured in over two-dozen Whitney Annuals and Biennials, and two Carnegie Internationals (1952 and 1958). Tworkov’s work is represented in more than 50 prominent public collections including the Museum of Modern Art, New York; Tate Modern, London; Metropolitan Museum of Art, New York; Art Institute of Chicago, IL; Solomon R. Guggenheim Museum, New York; Hirshhorn Museum and Sculpture Garden, Washington, DC; Walker Art Center, Minneapolis, MN; San Francisco Museum of Modern Art, CA; Museum of Fine Arts, Houston, TX; Albright-Knox Art Gallery, Buffalo, NY; Cleveland Museum of Art, OH; Wadsworth Atheneum, Hartford, CT; Harvard University Art Museums, Cambridge, MA; and Indianapolis Museum of Art, IN; among others. Tworkov’s painting is included in Leap Before You Look: Black Mountain College 1933-1957, curated by Helen Molesworth at the Hammer Museum, Los Angeles, CA; and Postwar Era: A Recent History; Homages to Jack Tworkov and Claire Falkenstein, at the Peggy Guggenheim Collection, Venice, Italy. Organized annually by the Art Dealers Association of America (ADAA), The Art Show presents curated presentations by the nation’s leading fine art dealers, providing audiences a selection of works from the late 19th century through today.